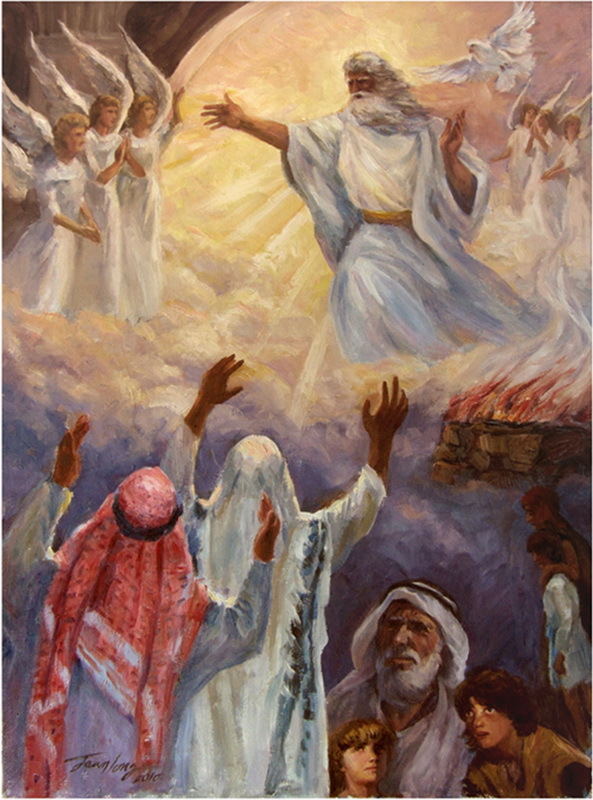 This painting depicts our Heavenly Father earnestly welcoming his sons Isaac and Ishmael back home to His Heart. Ancient gates of Heaven (shown on the upper left hand corner) are now opened. Our Heavenly Father looks on with joy as the holy angels sing, praise, celebrate and witness the fulfillment of His Father’s heart for the return and restoration of His sons to Him as well as to one another. In the middle of the painting lies an altar, representing God’s covenant with Abraham and the commemoration of its everlasting nature. Below the altar, are the silhouettes of Hagar and Ishmael, They are laden with anguish and the torment of separation as they are cast out of their home. In the bottom right hand corner, we see Abraham with his two young sons, Isaac and Ishmael (note their facial expressions) and in the bottom left hand corner is a present or future scene of both Isaac and Ishmael, standing together, reunited in their cry for their Heavenly Father. Our Heavenly Father is pictured in the middle of the painting with arms extended welcoming His two sons. His glory is shining on them and His love is poured out on them. The work of the Holy Spirit (represented by the dove) turns the Father’s Heart to His children and the hearts of His children to Him.